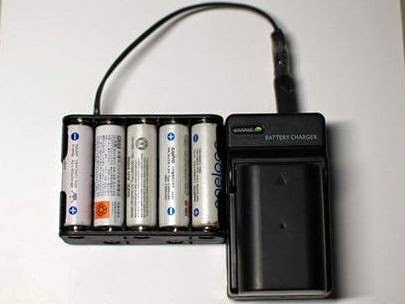 CompleteWalker: How to charge a lithium-ion battery of DSLR camera by solar panel. How to charge a lithium-ion battery of DSLR camera by solar panel. At last, I have bought Pentax　K-3. Although K-30 was ideal, because it can be driven by AA batteries, I did not satisfied with its image quality. I examined miller-less cameras; for example Olympus OMD E-M1 and FUJIFILM X-T1. 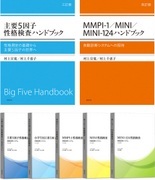 But, I could not tolerate for an electronic finder. As a result, I selected Pentax K-3. Its finder is excellent and It is built as dust and water resistant. However, it is a little heavy. The major problem was the charge of the lithium-ion battery. The recommended technique by the maker. The recommended technique by the maker is the combination of Nomad 13 solar panel and Sherpa 50 the lithium-ion re-charger. Sherpa 50 works slow with Nomad 7. But the weight of Sherpa 50 is 500 gram, and the cost is around 24000 yen. It is too heavy and too expensive. There are several cheap re-charger which have 12 V output by other maker, but their weight may be around 400 gram. It is not recommended for hiking usage. I connected with the 12V output of solar panel Nomad 7, and tested the charger from cigar socket. It hardly turn on the lamp of a charger. 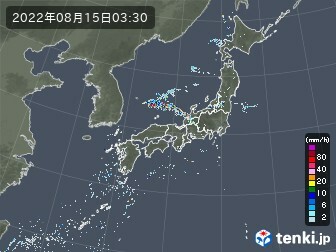 However, the indicator of cigar socket was turn on. Then I convinced that it was possible to charge. The level of the battery rose one step in one day, putting directly under the sunlight. I have no equipment which measures the level of a battery, I used the indicator of a camera. That is, seemingly, the full charge may be possible if it will be placed about three days under the sunlight. All the devices are shown in a following photograph. Required one is a cable for cigar sockets connecting 12V output of a solar panel (It was attached to Nomad 7), and a charger for cigar sockets. The charger was a cheap Chinese-product, its price was only 1090 yen. 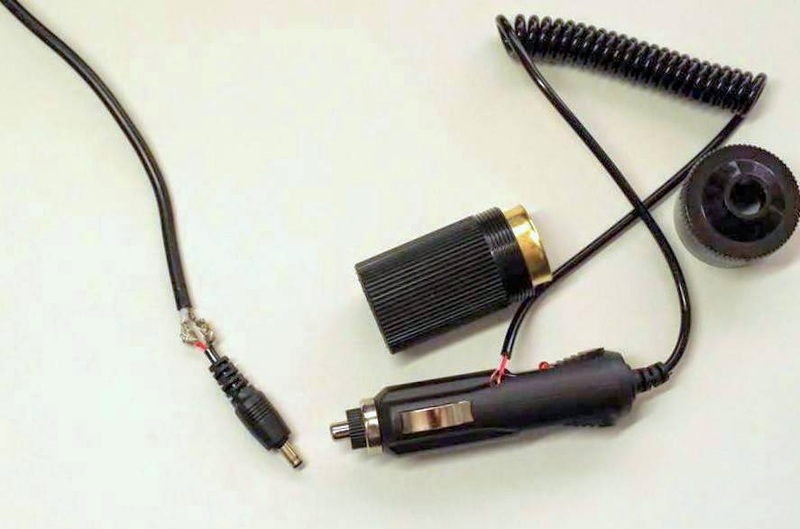 To reduce the weight, the DC cigar socket cable which connect to the output of 12V and the cigar cable of the charger should be removed. For that purpose, the female conversion plug of DC output may be needed. But, the female output plug of GoalZero was special, I could not find a suitable plug adapter. Therefore, I cut the cable and connected directory to the plug. The colors of inner cables were special, so I had to connect the white and the red cable. I removed the cigar socket and plug parts. They weighed around 50 gram and became compact. That is, I made the direct connection cable between GoalZero and the charger. The right side parts are unnecessary. 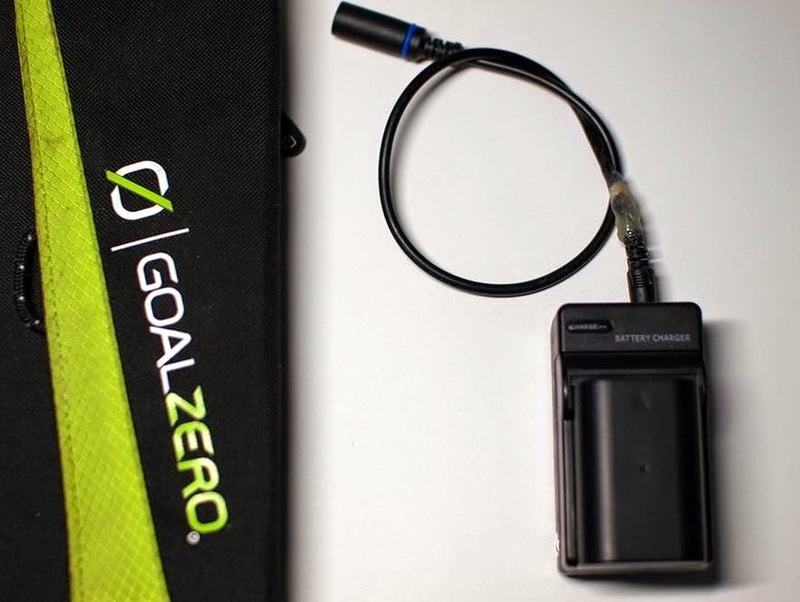 The direct connection cable between GoalZero and the charger. In order to make 12 V DC power supply, it is the simplest way to use 10 AA battery case. 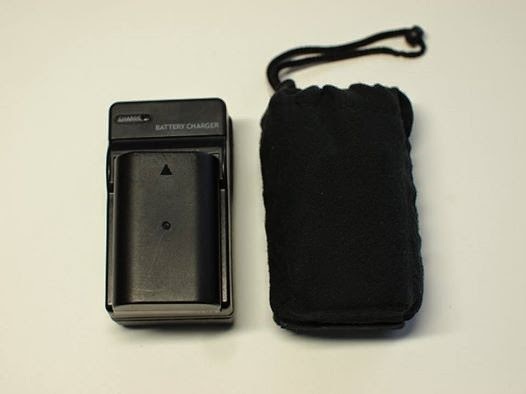 Since the voltage of re-chargeable AA battery is 1.2 V, the voltage of 10 batteries which were connected serially becomes 12 V. The battery case costed only 980 yen. Though regrettable, the DC plug is large. I changed to the small one using unnecessary cigar socket cable. The strong point of this technique is that the batteries can be charged by small solar panel. The weight of AA battery is around 25 gram, therefore, 10 AA batteries weigh around 250 gram. It also turn on the indicator of battery case rightly. I made from an unnecessary small stuff sack.